"Reusable Christmas Window Clings, Decals Stickers"
The Christmas window painting images shown here are for example purposes only. They have been photographed from prior window paintings, window clings and special commissioned orders. 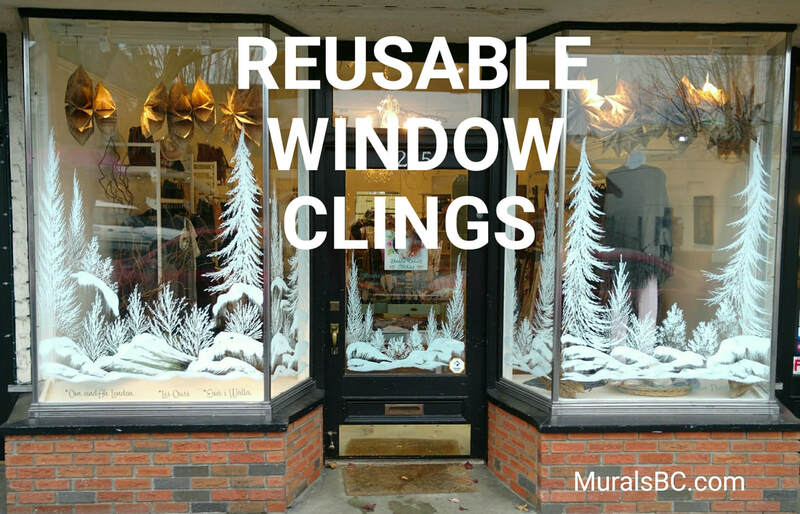 "ABOUT THE CHRISTMAS WINDOW CLINGS"
Original hand painted winter scenes which cling to your windows and are reusable year after year. no two paintings are identical. *Easily sticks to any window surface through static. *Easily removed by simply peeling off the window without leaving any residue. *Store the window cling until you are ready to reuse it again. *Enjoy your window cling for years to come. *Window clings are presently available in two different sizes. (1) 18" inches (1.1/2 feet) tall by 72" (6 feet) wide. (2) 24" inches (2 feet) tall by 72" (6 feet) wide. (Please note: If need be, your window cling can easily be cut with scissors to fit any existing trim on your window). ***Inquire for other "Special Order"
(1) Peel snow scene from it's backing paper. (2) lightly mist water on the window. (3) Place snow scene on the window. Every window cling order also includes a simple installation instructions guide for you.